Cece Bell has written a funny, touching and powerful memoir of growing up hearing-impaired. (She lost her hearing at age 4 when she contracted meningitis). She is transitioning from a classroom where all the kids were deaf to a school where she is the only deaf person. To counteract her deafness, she must wear a big unwieldy box called a Phonic Ear which, she discovers, helps her hear the teacher, Mrs. Lufton, in class, but also everywhere else Mrs. Lufton goes in the building (who knew what teachers did or said outside of class!). This makes Cece very popular. 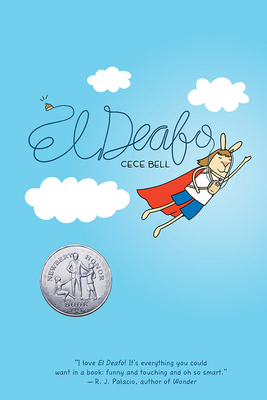 She imagines herself as "El Deafo," a fiesty super girl with superpowers. But she is smart enough to realize that being a superhero is just another way of feeling different, and feeling alone. Many details of a hearing-impaired life are presented beautifully and we can see them in our own lives, even as hearing persons, and we see the challenges of being a child (or feeling like one). What a great book! Kids who loved Wonder will also love this book. ~Judy B. — Judy Bulow is our Lead Children's Book Buyer & a TC Kids' expert since the 1980s.